Summer is finally here which means backyard BBQs and cookouts! It also means needing a great side dish to go with the grilled goodness. 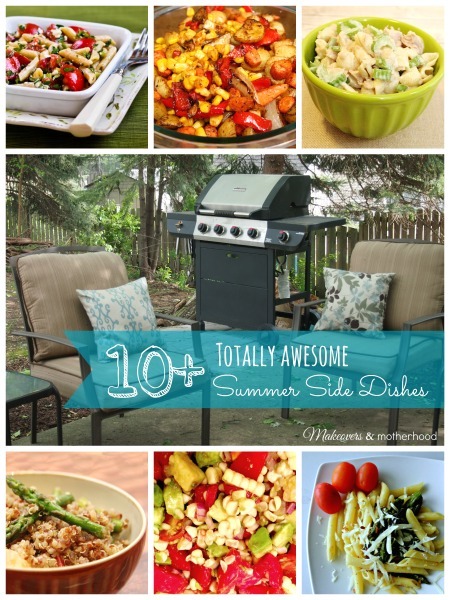 I’ve rounded up 10+ totally awesome summer side dishes for you to share! Step aside coleslaw, baked beans, and potato salad. There are some new favorites being served up. Some are completely new to me, but all are (mostly) healthy and fun flavorful choices! When I asked my blogging friends for recipes, Pasta Salad was #1. However, each recipe brings something different to the table. And they’re easy to make! Have a side dish that calls for hard boiling eggs? The Realistic Mama’s Easy Peel Hard “Boiled” Eggs may be your solution! AND… what’s a cookout without a great drink? Try Southern Style Southern Charm’s The Best Lemonade Punch Ever. And for a drink with a kick, check out this Skinny Whiskey Sour from Lalymom! With summer here, get ready for fun and great eats with these great recipes! Happy eating!